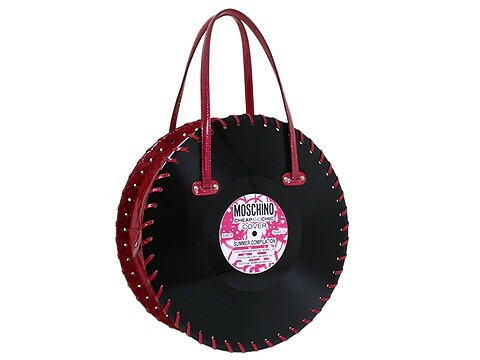 Rock 'n' roll around town with this funky handbag. Made of sumptuous leather. Holds your wallet, keys and personal technology. Dimensions: 3 1/2 wide across the bottom, 12 wide across the middle, 3 1/2 wide across the top x 4 deep x 12 high. ; Dual patent leather handles. Handle drop: 5 1/2 length. Protective dust bag included. Enlarged stitching. Authentic record style details. Double top zip closure. Satin interior lining with a back wall slip pocket. Made in Italy.